Prime Minister of Barbados, Mia Mottley has refuted claims that her government poached or enticed Ross University to move away from Dominica in a statement issued on Tuesday 7 August 2018. Adtalem Global Education, the parent company of Ross University, announced Ross’ departure from Dominica and relocation to Barbados during a joint press conference with Prime Minister of Barbados, Mia Mottley on Friday 3 August 2018. Since the announcement, a number of persons both locally and regionally, have criticized Prime Minister Mottley for the decision claiming that it would cripple the Dominica economy at a time when it is recovering from Hurricane Maria. 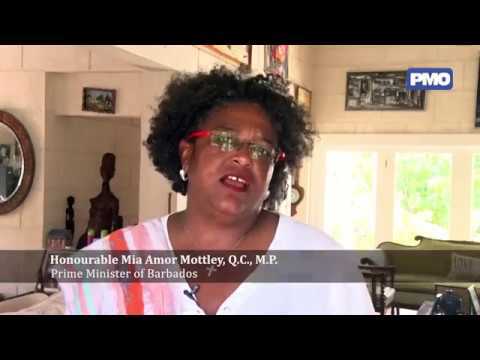 Ms. Mottley, in her statement, said while she is not qualified to speak for or on behalf of Ross, “but what I can say is that the hands of the Barbados Government are clean in this matter”. She further clarified that Barbados came into the picture, “only when, for Ross University, returning to Dominica for the start of the January semester in 2019, was not an option”. “This is not and has never been a case of poaching or enticing anyone away from Dominica,” she emphasized. Further, Prime Minister Mottley stated that the relationship between Barbados and Dominica is strong and noted her “personal” relationship with Prime Minister Roosevelt Skerrit. It is not clear however, when the Dominica Government was informed that Ross would not be returning as according to Member of Parliament for the Portsmouth Constituency, Ian Douglas as at 30 July 2018, government was doing all within its power to ensure that Ross returns to the island. The University, which had been operating here for forty years, relocated following the passage of Hurricane Maria in September 2017 as a result of damages to some of its building as well as apartments which housed the students. Prime Minister Mottley said her government inquired from Ross whether all options and scenarios had been explored and fully exhausted and “we spoke with officials of the Dominican Government who were still hopeful of a return of the school, but who conceded that a January start-up was highly unlikely given their circumstances”. However, it is not clear whether Prime Ministers Mottley and Skerrit discussed Ross’ move prior to it being announced. Further, Prime Minister Mottley said it was “only after Dominica was ruled out” for the January 2019 start-up of classes and when attention had turned to at least two other potential locations in the region, “that Barbados then embraced the idea of making itself available as a possible site for relocation”. She added that in all discussions with Ross, “it was stressed, ad nauseam, the impact the move would have on Dominica and the Dominican economy and the clear need to mitigate any fall out”. Barbados already has seven medical schools. What happens to them when the big boys come to town? I can’t blame Mia Motely for looking out for Barbados but i do have a problem with how she and Ross clandestinely went through the process. She claims to be friends with PM Skerrit but friends do not treat friends that way. Ross should have come clean and say they are taking a business decision and not say to the government that hey are coming back when they knew that they weren’t.